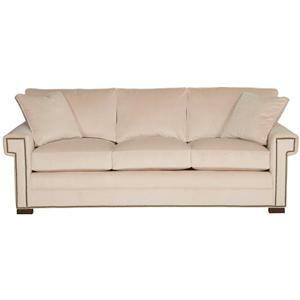 This elegant three seat sofa will fit right in with your transitional or traditional living room decor. 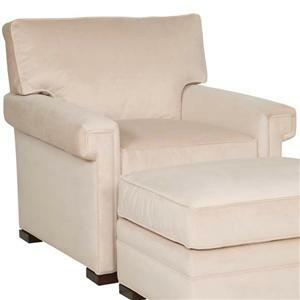 The high quality upholstered piece features durable construction so it will be a lasting favorite. Greek key style arms can be adorned with optional nail head trim, accenting the classic style, and an option for wooden block feet or an eight inch skirt let you really customize the look. Plush cushions and two throw pillows will keep you cozy. 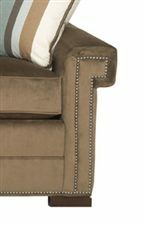 The Davidson Transitional Three Cushion Sofa with Greek Key Arms by Vanguard Furniture at Hudson's Furniture in the Tampa, St Petersburg, Orlando, Ormond Beach & Sarasota Florida area. Product availability may vary. Contact us for the most current availability on this product. Fabric Options Available in a variety of fabric and leather options. Tailoring Welt cord trim for a clean tailored look. Arm Greek Key style arms with optional nail head trim. Leg or Skirt Option of 8 inch skirted base or square maple wooden block feet. Padding & Ergonomics Feather Lux cushions. 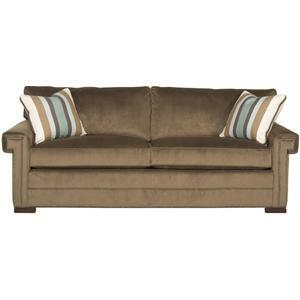 The Davidson collection offers fresh style for your living room. Sustainably built by skilled artisans in the USA, these pieces feature quality construction. This collection features a transitional style that will blend nicely with different types of home decor, offering a classic look that is updated and modern. Greek key arms, clean lines, and optional nail head trim create a well-tailored look to add a pop of pizazz to your room. The Davidson collection is a great option if you are looking for Transitional furniture in the Tampa, St Petersburg, Orlando, Ormond Beach & Sarasota Florida area. Browse other items in the Davidson collection from Hudson's Furniture in the Tampa, St Petersburg, Orlando, Ormond Beach & Sarasota Florida area.